It might put you off that this old recipe because it starts off “Place the barley in a large bowl. Cover with water; soak overnight”. But if you be bothered doing it the barley will make the soup delicious and when you add in the lamb and vegetables you’ll end up with a very hearty and warming winter dish. 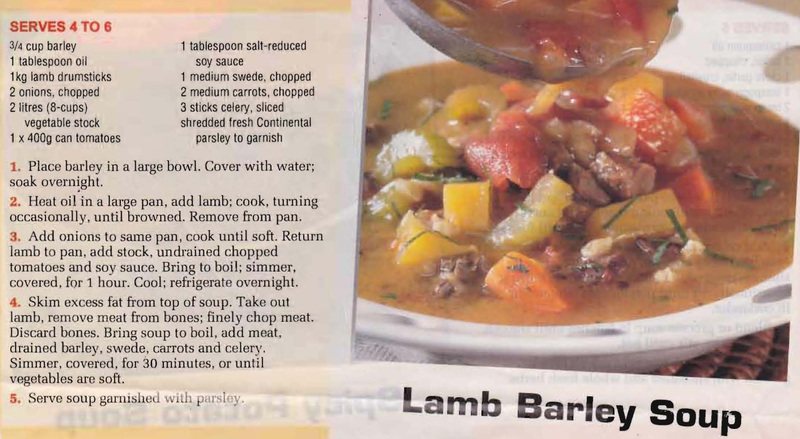 This entry was posted in All Recipes, Soups & Starters and tagged 1990s, barley, carrots, celery, lamb, lamb barley soup, onions, soy sauce, swede, tomatoes by bebsrecipes. Bookmark the permalink.